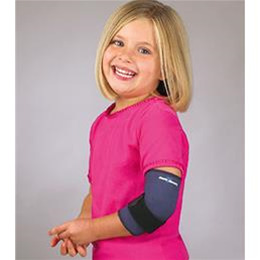 NEOPRENE ELBOW SUPPORT KIDS :: BRACES & SUPPORT :: FLA Orthopedics Inc.
Neoprene sleeve helps provide temporary relief of pain due to tendinitis or tennis elbow. Sports neoprene sleeve coverage provides therapeutic warmth around the entire elbow joint. Soft nylon loop lining. An added strap gives even greater support. Strap is easily adjusted with the loop lock closure. PED/LARGE (5 - 7 yrs) 6 1/2 - 7 1/2"